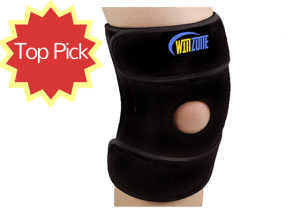 Finding the Best Knee Brace for Torn Meniscus is easier than you think. Here’s a rundown of our favorites. Meniscus tears are one of the most common knee injuries with more than 200,000 cases in the U.S. each year. They occur in the rubbery knee cartilage that pads the shinbone from the thighbone. Many physicians agree that wearing a knee brace can provide the stability, compression, and warmth needed to aid in healing. To distinguish the good from the bad, our team tested a variety of knee braces currently on the market. We found the following options to offer the best in comfort, function, and effectiveness. Type: Knee braces can be categorized into four main types: supports, sleeves, hinges, and stabilizers. Choose one that meets your lifestyle and recovery needs. Style: The main styles of knee braces include slip-on and wraparound varieties. Slip-on braces slide onto the knee through an opening and wraparound braces fit around the knee using Velcro straps. Patella: Most knee braces come with an open or closed patella. If you want your kneecap to receive equal compression as the rest of the knee, choose a closed patella style. Size: Size plays a major role in the effectiveness of a knee brace. Be sure to properly measure the circumference of your knee and follow the sizing guide to find the perfect fit. Knee pain caused by a torn meniscus can make it hard to get up in the morning and go on with your daily responsibilities. Having a high-quality brace like the Knee Brace Support by Winzone can help significantly. 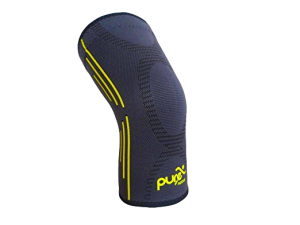 After rigorous testing, we choose this as our top choice for knee braces for a torn meniscus due to its overall design and effectiveness. The knee brace sports an athletic look and fits comfortably over the knee using Velcro straps to create a customized fit. The brace is made from a flexible neoprene material that is non-bulky but highly efficient at stabilizing the injured knee. Best of all, your torn meniscus won’t stop you from getting around as the brace offers adequate support without restricting movement. You don’t have to pay an arm and a leg for a quality knee brace. This affordable product has been proven to reduce pain while aiding in recovery whether you’re lounging at home or engaging in your favorite sport. Best of all, it won’t slip, get hot, or restrict movement. 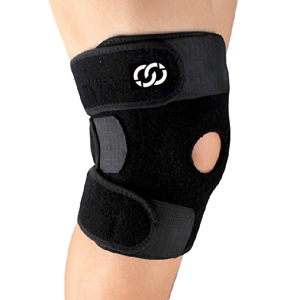 For the highest level of support after suffering a torn meniscus, a hinged brace is essential. After testing numerous brands, we found the McDavid Knee Brace with Dual Disk Hinges to stand above the rest. 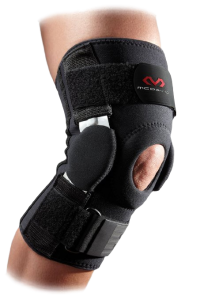 This versatile brace fits the right or left knee and offers adequate protection, support, and pain relief. The knee brace does not have gears, making it non-bulky and comfortable to wear for extended use. Instead, each sidearm is articulated independently with cushioned hyperextension stops. The arms have also been made wider for extra strength. The engineered straps also create a personalized fit. Best brace money can buy! 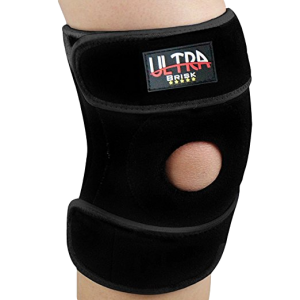 Our next choice for one of the best knee braces for a torn meniscus is the Ultra Brisk Medical Grade Knee Brace by Ultra Brisk. This FDA-approved knee brace is designed to support and secure the knee to reduce pain and get you back on your feet. The brace features a two strap system that helps stabilize injured ligaments and weak knees without restricting movement. When fitted correctly, the brace also helps to take excess pressure off of the knee which allows you to remain mobile. The innovative knee brace can be used for everything from meniscus tears to arthritic pain and ACL/LCL. Each brace has four extra stabilizers designed to help you recover faster from your knee injury. The lightweight blended fabric is comfortable against the skin and provides ample flexibility that allows you to move your knee freely. A purchase of the Medical Grade Knee Brace also comes with a free e-book that teaches you how to reduce pain and decrease recovery time. Want to get your normal life back after suffering a torn meniscus? The Knee Brace Support Brace by Compressions may help. Available in sizes ranging from 12 to 18 inches in circumference, the versatile brace adjusts using Velcro fasteners to secure the brace around the knee for a customized fit. The brace features silicone anti-slip strips that prevent it from sliding or slipping on the leg. The brace is also comfortable, breathable, and flexible without being bulky. Each brace also has spring side stays that help to stabilize the knee and provide lateral support. We also liked the open patella design that allows for greater leg movement. If you prefer the comfort and flexibility of a sleeve, you can’t go wrong with the Pure Support Compression Knee Sleeve. Ideal for running, basketball, CrossFit, and any other sport, the versatile sleeve has a single wrap design that fits flawlessly under most clothing for a discrete, yet effective look. You’ll find the sleeve in a wide range of sizes to accommodate men, women, and children. Be sure to review the sizing chart to find your perfect fit. The knee sleeve is designed to provide fast recovery from knee injuries or surgeries. With limited Patella movement and graduated compression, the sleeve provides just the right amount of compression while offering adequate movement. The 3D circular technology helps to extend the lifespan of the sleeve while the non-slip grip material is comfortable without causing itching or irritation. When worn as instructed, the knee brace provides warmth and improves muscular recovery and blood circulation.